When Curiosity took the photos, the rover was nearly 11 miles (18 km) from the landing site where its journey began back in 2012. 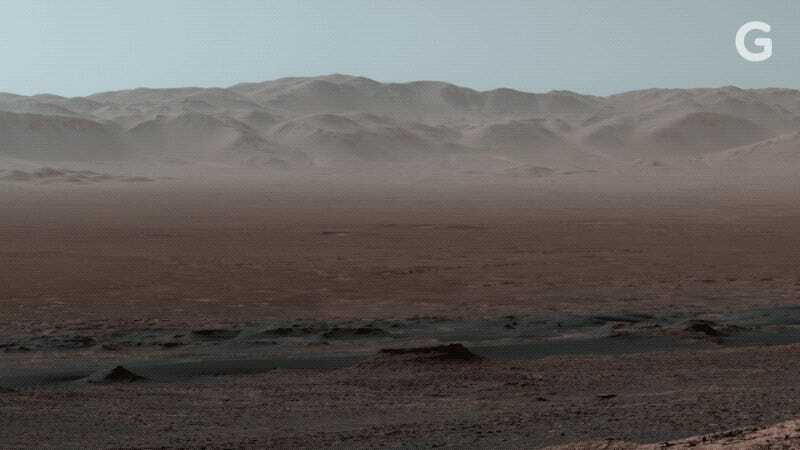 From this vantage point, the rover could scan the wide expanse of the interior rim of the Gale Crater. And in fact, much of the horizon seen in the photo is formed by the crater rim, which spans 96 miles (154 km) in diameter. The middle distance shows portions of Gale Crater’s relatively flat floor. At the top of Vera Rubin Ridge, Curiosity was also able look back on the route it took to get to its current location—a journey that has seen the rover travel 50 miles (85 km) from its landing site. NASA has also provided an annotated version of the panorama (above), showing the rover’s approximate path since its 2012 landing. In the middle of the photo stands Mount Sharp, a feature that stands three miles high (5 km). Other geological features include Yellowknife Bay, The Kimberley, Namib Dune, and Murray Buttes. An ancient streambed called Peace Vallis is visible, along with the very dramatic Slangpos Crater. Here’s what the scene looks like from directly above, as pictured by NASA’s Mars Reconnaissance Orbiter. Thank you, Curiosity, for being our eyes on Mars. Hopefully we’ll be able to join you someday and take in the spectacular view for ourselves.